The Marauder armored combat suits and the "Q-Bomb" (originally called the "Nova Bomb") are the main elements drawn from Robert Heinlein's original novel in this film. Many fans were disappointed that the former did not appear in the first Starship Troopers film. Continuity: When the Marauder team is stripping down in preparation for the BioScans, Lt. Link Manion removes her shirt twice. Official voice: Across the federation, federation experts agree that: A: God exists, B: He's on our side, C: He wants us to win. It was refreshing to see they reclaimed much of what made the first movie great when making Marauder. The filmmakers tried to copy the 'style' of the first movie, and in some aspects they succeeded. In others however, they failed miserably. Nevertheless, I think they put a lot of effort into the movie this time. For example, the federation broadcasts of the first movie were fantastic because they carried a lot of atmosphere and had so much subtle irony included. In the third movie, I think they overshot the mark a bit. There are a lot of broadcasts and they do a good job helping to create the film's atmosphere, but they are so openly ironic and sometimes it's almost comedy. One would think the officials are crazy to actually air that (Strongly in contrary to the first movie's broadcasts). The story is not too bad. If you are willing to overlook some flaws you might find to like it. They even implemented a plot twist, which however was not very surprising at all. What I really could not stand was the needlessly exaggerated part about religion. The cast is OK, but I think the filmmakers should have brought more old characters. It was nice to see Rico again; however it seemed the main characters were actually Lola and Dix instead of him. Dix's character also acts unreasonable on several occasions. And I found that the cast for the sky marshal was good, he has some charisma. CGI effects are not very impressive. The bugs seem slightly worse animated than in 1997. So do explosions and the settings. The space ships and broadcasts look nice though. Music is very average. Aside from the great song in the first broadcast there are no themes that would grab your attention. You would expect much much more of Klaus Badelt after his Pirates of the Caribbean score. Maybe he should have oriented his work more on the fantastic score of Basil Poledouris from the first movie. There is perhaps just one tiny little moment towards the end, where you would notice the music as great support for the scene. But once you notice it, its already over. Writing this review I feel that there is actually not much positive to say in detail. But the composition of all these clearly average components is slightly better, because the atmosphere was right. 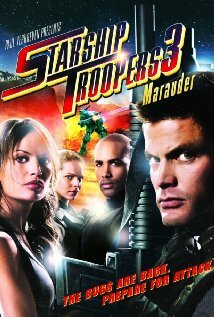 It can be seen that this is in fact a Starship Troopers movie and not only shares the same name, as the second one did.